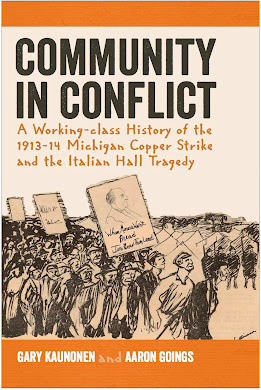 Beginning July 23, 2012, the 99th year since the beginning of the 1913-14 Michigan Copper Strike, we are chronicling our efforts to write a Peoples' History-style book on the Michigan Copper Strike. We are writing a workers' history of the event, and hope this perspective engages readers with the complexity and struggle faced by Michigan copper workers and their families. Bad news to report on the heritage preservation front. The Copper Country Historical Collections are closed until further notice due to a fire and the resulting water damage of the zoned fire suppression system. The book's cover featuring original artwork from the time of the strike. Two labor historians from different peninsulas (Keweenaw and Olympic) coming together to write one history of a community in conflict during the 1913-14 Michigan Copper Strike. Gary Kaunonen did his undergrad at MSU-Mankato; then a Masters at Michigan Tech, studying Industrial History and Archaeology. Research interests: immigration, labor and social history, industrial communities, material culture of the working class, social justice, public history, and working class rhetoric. His Master’s thesis was on Finnish American labor history in Michigan. He is the author of two books published by Michigan State University Press, one of which won the 2010 Historical Society of Michigan Book Award. He also co-authored "Industrial Calumet" for the NPS, which won an award from Association of Partners for Public Lands. Before academic life, Kaunonen worked in industrial jobs in a foundry and welding shop. Recently, he's worked for Keweenaw National Historical Park, as a freelance historian, as the Archivist, Historian and Collections Development Coordinator at the Finnish American Historical Archive, and adjunct faculty at Keweenaw Bay Ojibwa Community College. Currently he is the Assistant Director of Michigan Tech's Writing Program, a Graduate Teaching Instructor, and a PhD student at Michigan Tech in the Rhetoric and Technical Communication program. Aaron Goings is an assistant professor of history at Saint Martin’s University in Lacey, Washington, where he teaches courses on research methods and United States Social History. A longtime resident of Grays Harbor, Washington, Aaron’s interest in the Copper Country stems from his earlier studies of Finnish-American labor history in the Pacific Northwest, and the similarities between the ethnic and labor history of the Upper Peninsula of Michigan with Washington’s Olympic Peninsula. His scholarly interests include labor and the left, Pacific Northwest History, and history of the lumber industry. His dissertation "Red Harbor: Class, Violence, and Community in Grays Harbor, Washington," was completed at Simon Fraser University in 2011. He credits his interest in labor and radical history to his working-class upbringing, which included many hours on picket lines and participating in Labor Day parades. Aaron notes that in Grays Harbor people still consider it to be a major offense to cross picket lines. (c) Copyright the Authors (Gary Kaunonen and Aaron Goings). Watermark theme. Powered by Blogger.